Rock outcrop, often granite, found perched on the summit of rounded hills. 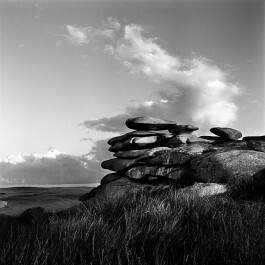 Tors are composed of large, well-jointed blocks stacked on a platform of solid rock, a structure that suggests a massively up-scaled, deliberately made cairn. In fact, there is no consensus on how tors are formed and in particular whether the rocks are sculpted by freeze-thaw weathering when exposed or whether the structures are chemically eroded while still subterranean. Old English torr, perhaps of Celtic origin and related to Welsh tor ‘belly’ and Scottish Gaelic tòrr ‘bulging hill’.